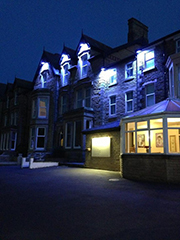 The Ashton Park Hotel formerly know as The Langdales Hotel is set in the heart of St Anne’s on sea and is owned and run by The Young Family. We pride ourselves in offering all our guests a first class service with a smile, offering quality and comfort, but still retaining that personal touch and friendly atmosphere. This is a classic family seaside destination and though actually close, we could be a million miles from the flashing lights and one armed bandits of Blackpool. Our bedrooms offer you the services that we consider Standard for this kind of establishment, at an extremely reasonable price. All rooms come with a en suite bathroom. All of our kitchen staff have been trained and are happy to talk to you about the dishes on all of our menus. We select the best from traditional British dishes, using locally sourced, fresh, seasonal produce. We have an indoor heated swimming pool, steam room and Jacuzzi,which are complimentary for all our guests.